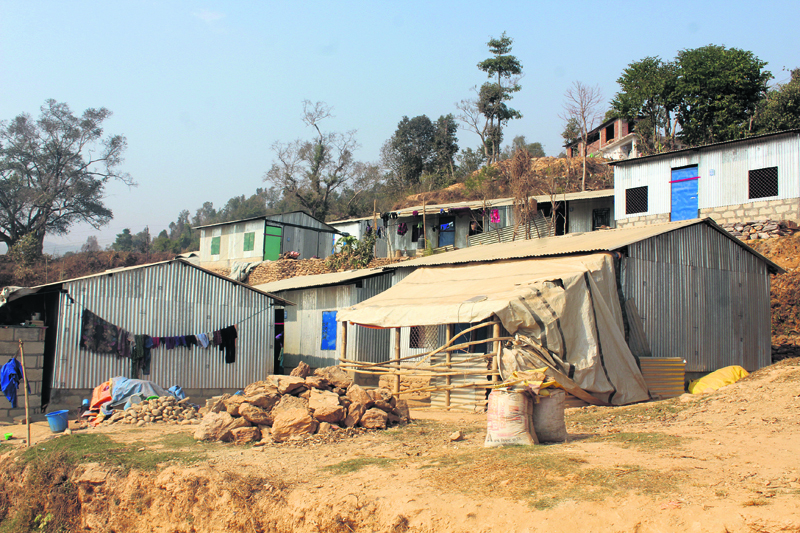 Republica A temporary settlement of earthquake victims near Dahding Besi. DHADING, March 14: Nearly two years after the massive earthquake, reconstruction works in Dhading has not yet taken momentum. Organizations responsible for reconstruction are unable to carry out the activities due to lack of manpower and construction materials. According to Umesh Dhakal, chief district officer of Dhading and co-coordinator of the District Disaster Relief Committee (DDRC), lack of proper planning has made it difficult to conduct reconstruction activities. The government had agreed to provide housing reconstruction grants to 63,151 houses in Dhading out of which 62,000 houses have received the first installment. But only 34,000 houses are being built now. According to the DDRC, 800 houses among them have submitted the forms for the second installment. Out of 88,541 houses in Dhading, 81, 313 houses were completely damaged by the earthquake. As per the report of the District Central Bureau of Statistics (DCBS), 70, 581 victims in Dhading are eligible for the relief. “There is lack of manpower in the District Development Committee (DDC) and village development committees (VDC) and the increase in price of construction materials has been really challenging for us,” said CDO Dhakal. He further informed that they have no option than to hire workers by paying high wage from other districts due to lack of sufficient workers. “As long as we don't conduct trainings to enhance the knowledge and skills of workers and increase the manpower, reconstruction works cannot be conducted properly,” said Chakrapani Timalsina, support officer of the DDRC. As per the report of the DDRC, various non-governmental organizations have provided trainings to around 4,200 people after the earthquake. But quake victims lament that they have not been able to build their houses yet due to lack of manpower. “The process of receiving government relief is difficult and the banking system is not practiced properly here, which has added to the problem,” Timalsina added.